In spite of its modern fire protection system the mill was a complete loss. The sprinkler system failed to operate as intended. One source claimed "a failed bearing in a water pump was to blame. "1 Due to the nature of the fire and the way the building was constructed it's possible the sprinkler system would not have been able to keep up with the fire anyway. When the smoke cleared all that remained of the mill was its towers, part of the front and rear walls, and the hull of the engine room. The rest was reduced to a pile of rubble. The monetary loss for the mill was reported as $250,000.2 The villagers awaited news and pondered the fate of the village they had grown to call home. 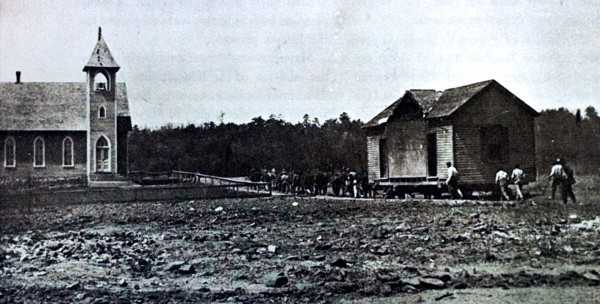 On June 25, 1911 the villagers found hope when it was announced the mill would be rebuilt and put back in operation.3 Scrap metal from the machinery in the mill was sold to the Benjamin Bernstein Foundation of Richmond, VA4 and a group of teenagers found work in "skinning" brick to be reused in the mill. However, their hope was only temporary. The mill's owners changed their minds and decided not to rebuild. Instead, the village of Avalon would be dissolved and the houses moved to Mayodan. Because the village and all of its houses were company property, the villagers had no say in the matter. Ola Maie Foushee recalled that no one wanted to leave. The Village of Avalon was like one big family who lived together and worked together, sharing the same joys and hardships. Avalon was a small community where everyone knew each other. At its peak, there was between four and five-hundred people living in the village. During the year following the fire, the houses were uprooted one by one from their foundations and rolled to Mayodan on logs pulled by teams of sixteen or more mules and horses.5 Some of the villagers remained in the village until their houses were moved and hiked to Mayodan each day to work in the Mayo mill. Others in the village loaded their belongings on wagons and moved elsewhere. By February of 1912, most of the houses were gone and the use of the Avalon church had been discontinued.6 The last child born in Avalon was Sarah Elizabeth Poole(Sarah Elizabeth West) on March, 4 1912. The church building was sold to Mr. S.P. Tesh and Mr. Luther Martin of Mayodan. The church was torn apart and its materials were recycled into other buildings.7 The brick store building and the home of James Samuel Suttenfield were left behind as they could not be moved — both of which have since been destroyed. More than a hundred years have passed since The Avalon Mills burned to the ground. Some may say that it was just a mill village — it was more than that. While the mill and village were not of major historical significance, the area is rich with heritage. A lot of people built their lives and families there. The story of Avalon is a haunting one, filled with joy and tragedy. Many of the details have been long forgotten; however, the story of Avalon's people deserves to be preserved. Although the village is gone, the residents of Avalon have touched the lives of many. Fig. 35. One by one, the houses were removed from Avalon and were rolled to Mayodan. 1. Foushee, Ola Maie, Avalon: A North Carolina Town of Joy and Tragedy (Chapel Hill, NC: Books, 1977), 78. 2. "Cotton Mills Burned," The Free Lance(Fredericksburg, VA) June 20, 1911. 3. "New Industries of Week in South," The Times Dispatch (Richmond, VA) June 25, 1911. 4. Foushee, Ola Maie, Avalon: A North Carolina Town of Joy and Tragedy (Chapel Hill, NC: Books, 1977), 81. 6. "Echos of Christmas, 1911," The Wachovia Moravian (Winston-Salem, NC) February 1912, 4. 7. Foushee, Ola Maie, Avalon: A North Carolina Town of Joy and Tragedy (Chapel Hill, NC: Books, 1977), 76. Fig 35 - Unknown, Moving House (1911-1912), Location, Avalon, NC, Image [from Avalon: A North Carolina Town of Joy and Tragedy (Chapel Hill, NC: Books, 1977), 91].